Hey, Chicken Nugget Fans, Get a Load of This! A concerned reader sent me a link to an article in the Huffington Post today that absolutely grossed me out and I thought I had seen it all where processed factory food is concerned. 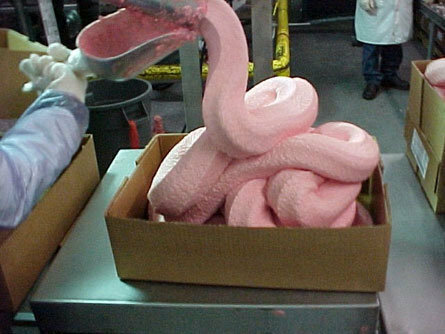 This picture is of mechanically separated chicken meat, also called Advanced Meat Recovery (yes, you read that right) before it is made into chicken nuggets, bologna, hot dogs, salami – uh, shall I continue? Companies that produce processed food with this nauseating ingredient try very hard not to let photos like this get out to the public for obvious reasons. According to Fooducate, this chicken paste is the result of cleaning every bit of meat off the chicken bones by passing it through a high pressure sieve. It tastes horrible, so artificial flavors like MSG and many other additives must be mixed in to make it palatable. The color is very odd and unappetizing requiring the cover of artificial colors. It is covered in bacteria, so the paste must be soaked in ammonia to degerm it (see comment below from Stanley Fishman Esq. discrediting denials of this from Snopes). Anyone up for the fast food drive through? Seeing a photo like this, I am so grateful for my local poultry farm! Do you have one yet? What are you waiting for? Update: It seems that Subway chicken sandwiches may be channeling pink slime too according to a report which conducted tests on the chains “oven roasted” chicken sandwiches and strips.